I've been knitting in the evenings while binge watching Designated Survivor. Brenda recommended the series to me, and I'm hooked. 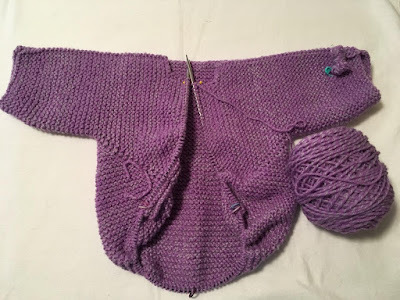 With all the evening knitting time, the Baby Surprise Jacket (BSJ) is progressing nicely, and I hope to finish it by the end of the week. I've knit the pattern numerous times, but I still marvel at the ingenuity of the design. This BSJ will be toddler size when finished. Sara (My Sewing Room) has been making Ritzy Cracker blocks for several months, and I loved them more as her pile of blocks grew. 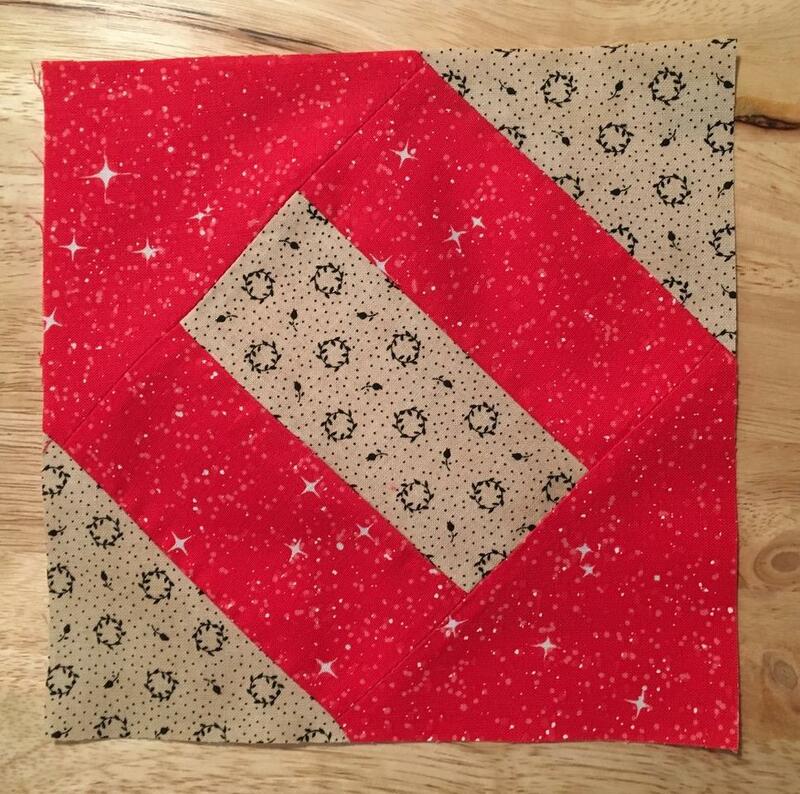 Sara made her blocks with 5" squares of fabric, but I had a pile of 4.5" squares cut from fabric scraps. I decided to make some of the blocks - oh my, this block is definitely a "potato chip" project, as it's hard to stop making the blocks. I made a prototype block with two 4.5' squares: the squared block is 7" which will finish at 6.5" in a quilt. For an adequate sized Quilt of Valor, I will need 72 blocks. Ritzy Cracker Quilt pattern can be found on Moda Bake Shop site. My knitting has slowed to a crawl. 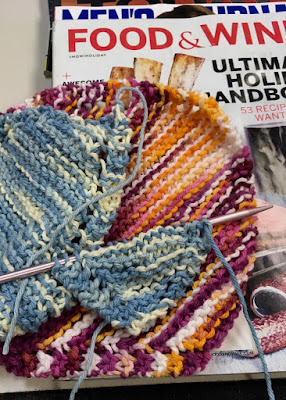 Normally, I have three or four active knitting projects, but currently I have two - cotton dishcloths (they really shouldn't count as a project) and a newly started Baby Surprise Jacket. I have a lace scarf on another set of needles that has been stalled since June 2017. I need to put the project bag by my chair to work on in the evening, but I've lost interest in it. 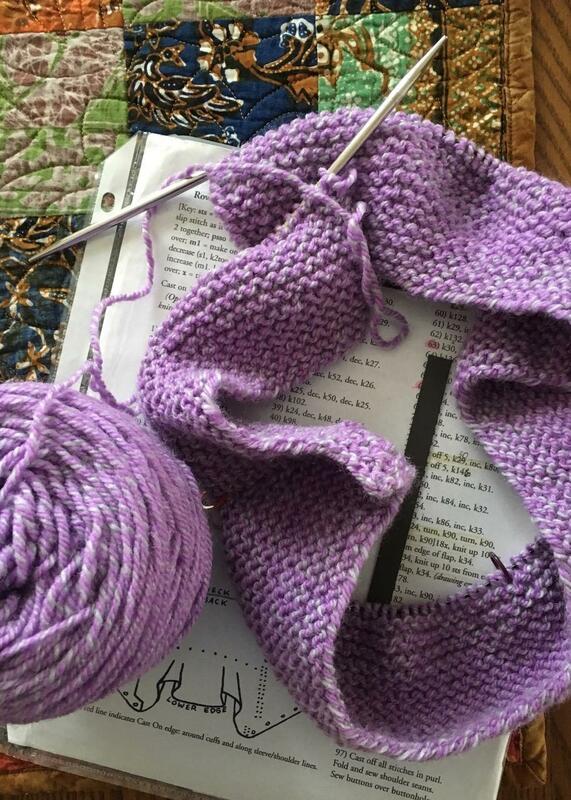 It's time to finish the scarf or to frog it. 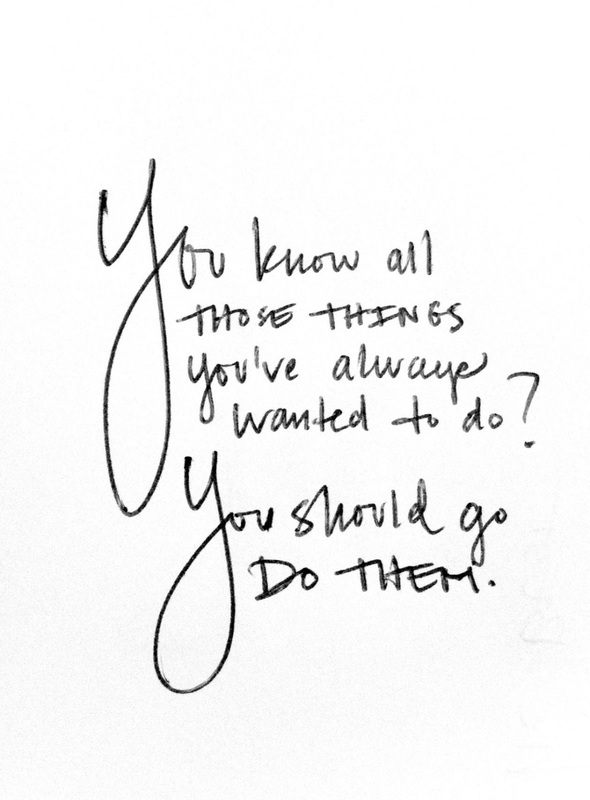 Do you have a project that has been neglected for a year or more? 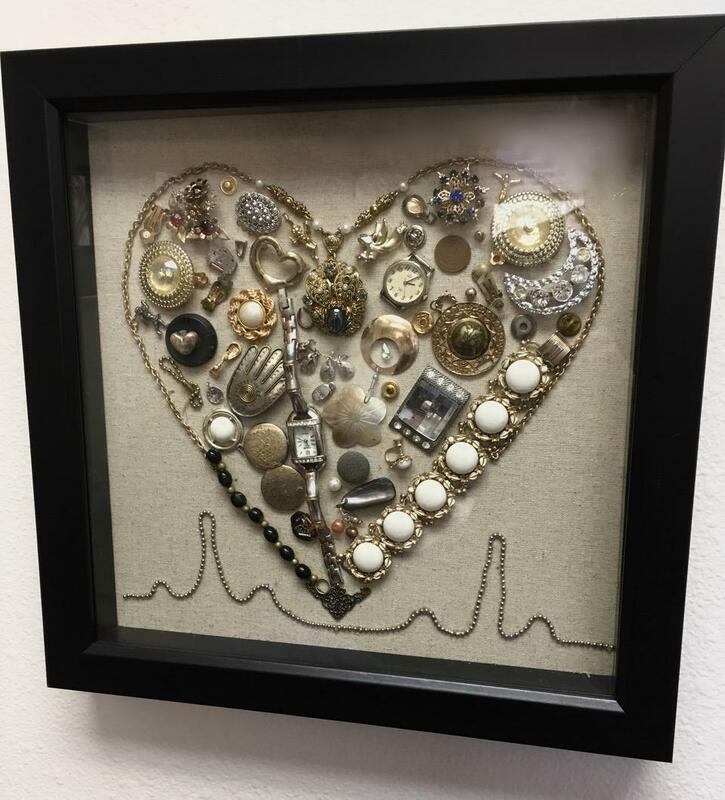 Last Monday, I had an cardiologist appointment in Casper, Wyoming, and in the exam room were two shadow boxes with bejeweled "hearts." The nurse told me Dr. Novick's wife made the displays. It was difficult to get a good photo because of the glare on the glass. Don't you love that she found a charm to "sign" one of the pieces. 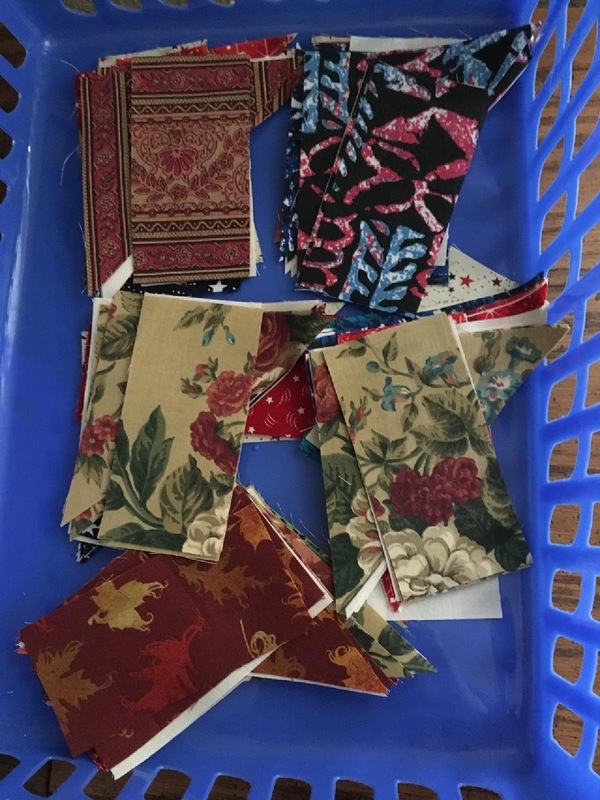 Friday afternoon, I pulled 3.5 inch squares from my scrap fabric bin and began matching them to create nine-patch blocks. Before the afternoon was over, I had sewn 43 nine-patch blocks, and the 3.5 inch scrap bin was empty - I had officially found the bottom of the bin. I asked my "quilt consultants," Marilyn and Brenda, what color of sashing to use, and both said, "Dark." I pulled a couple of black fabrics, and via text, they both selected the same one - a black tone on tone. 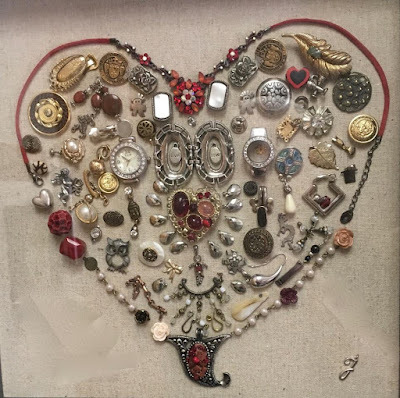 Do you snap photos of your projects and ask others for advice via text messages? Warmer temperatures have returned this week, and I hope Indian Summer will settle in for a bit. 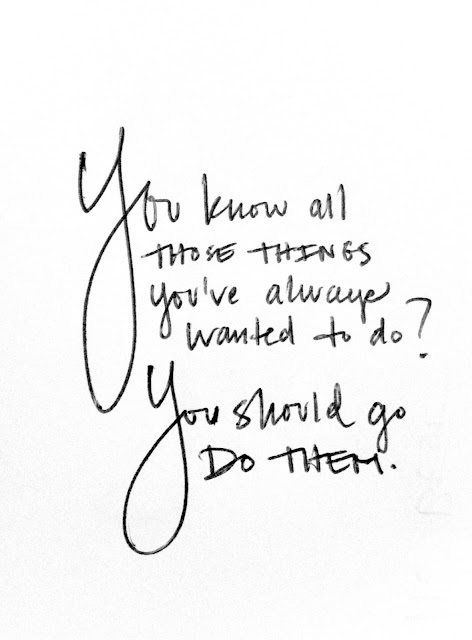 I'm not ready for cold, ice, and snow to take up residence for several months. 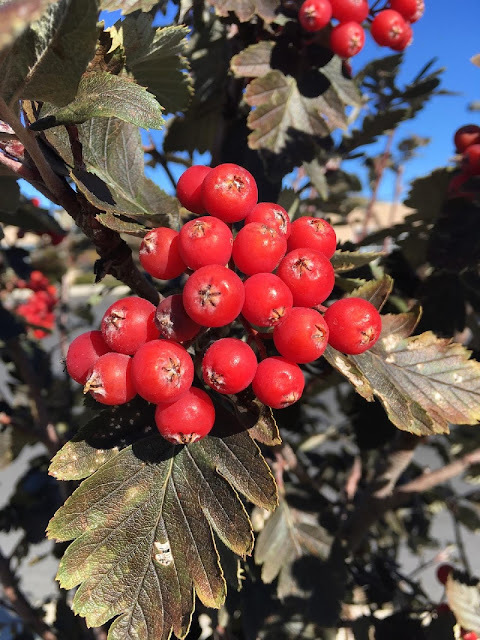 I dropped by the credit union on Thursday, and a tree with the bright berries caught my eye. The tree had numerous berry clusters - an unexpected burst of Autumn Color. A cold front zapped most of Wyoming with bitter cold, rain, ice, snow, and fog on October 13 & 14, 2018. As a result, many trees in Laramie have dry, brown leaves clinging to their branches, and the leaves rattle in the wind. I wonder if the leaves will eventually fall. 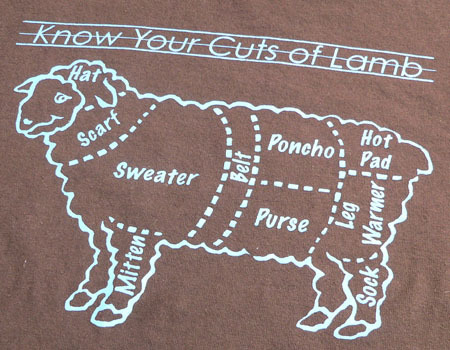 Are you currently using a specific "cut" of lamb in your project(s)? 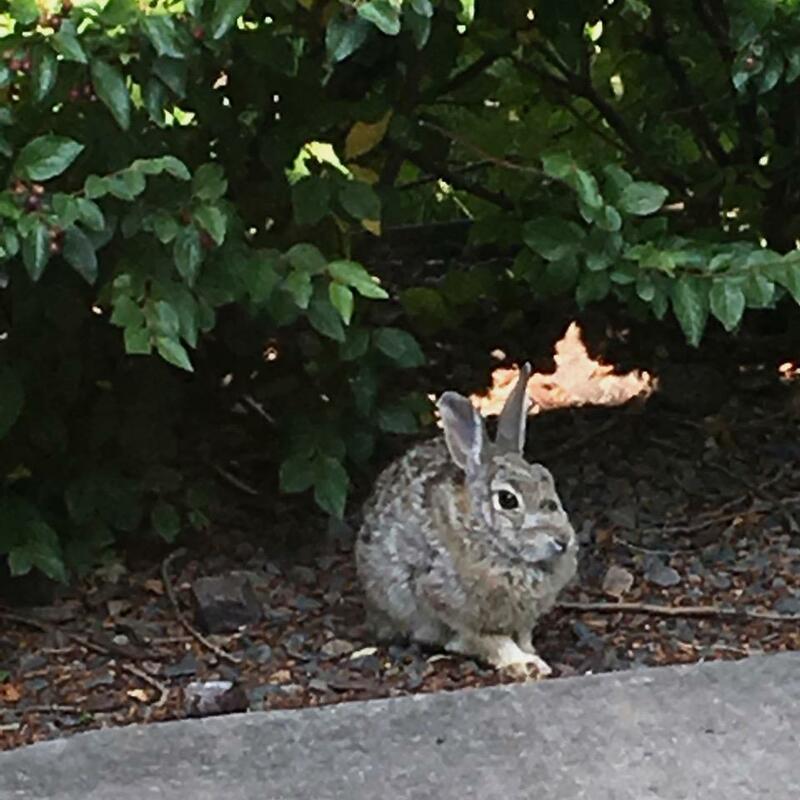 Early September, I saw this rabbit frequently outside my front door. It "hid" under the hedge and under the large pine trees every day for several weeks. The temperatures have cooled considerably the last two weeks and the trees/plants around town are beautiful dressed in their Autumn colors. 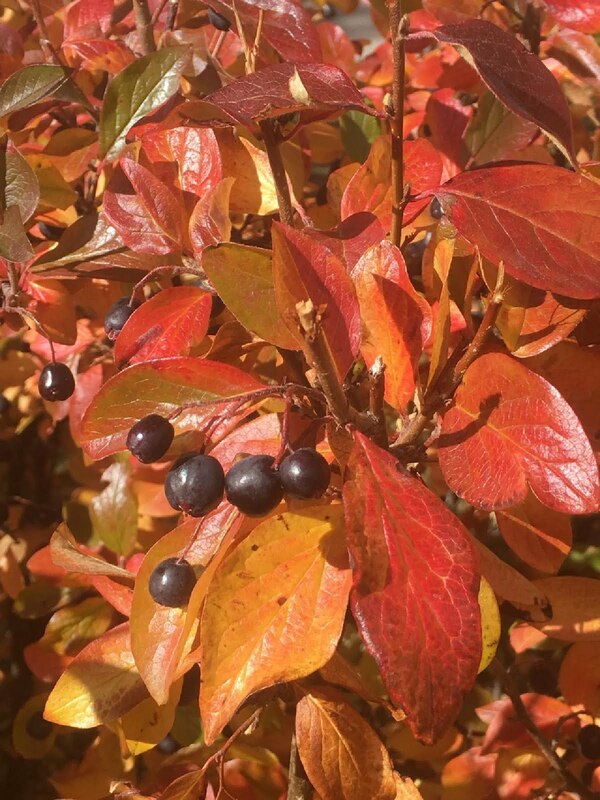 The rabbit's hedge is now filled with red, orange, gold, and green leaves, and the birds are feasting on the berries. The fruit must be intoxicating because the birds sometimes hit the windows or the screen door. Brenda gave me this wreath several years ago. Such are the "wild life" happenings outside my new front door. 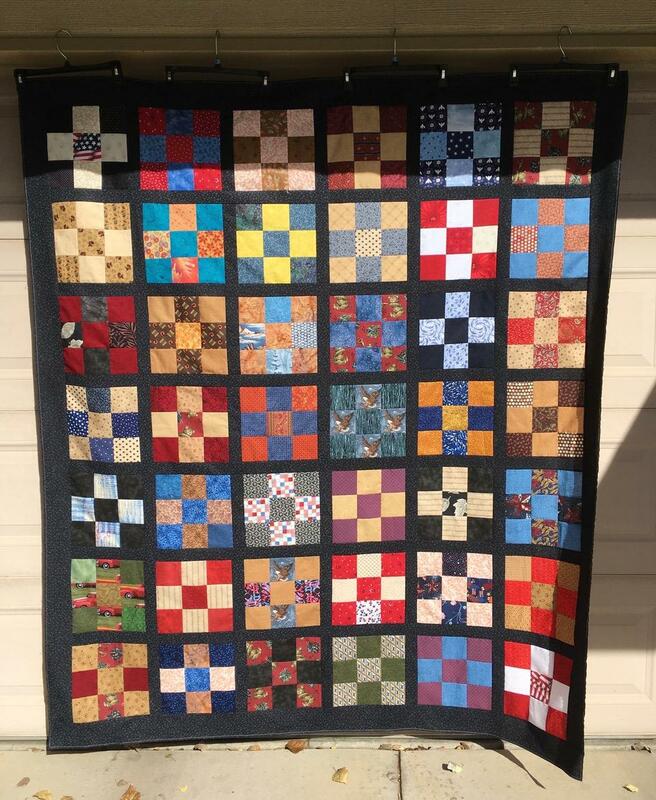 Two Quilts of Valor were returned to me last week from Darlene W. in Nampa, ID, a volunteer longarm quilter. The binding was already prepared, so I made a label and stitched it and the binding on the quilts. 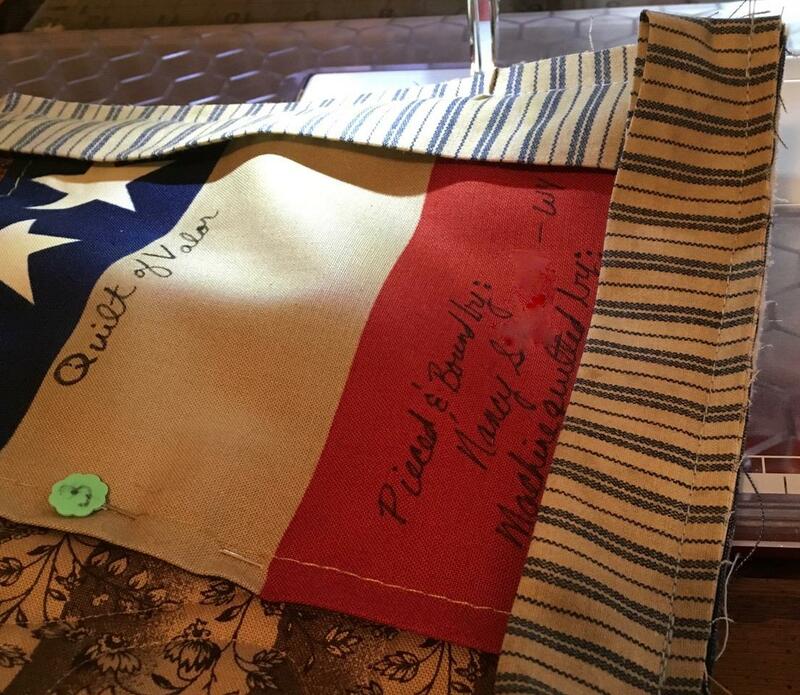 The area under "Quilt of Valor" will be used to add the recipient's name and the date the quilt was presented. I met with the Laramie Quilt of Valor group earlier this month. 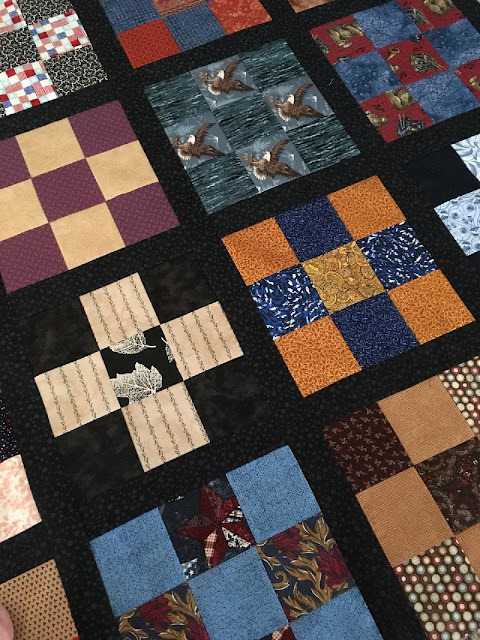 The group is a little over a year old and has only begun to award quilts to the veterans in the area. Alrighty Then . 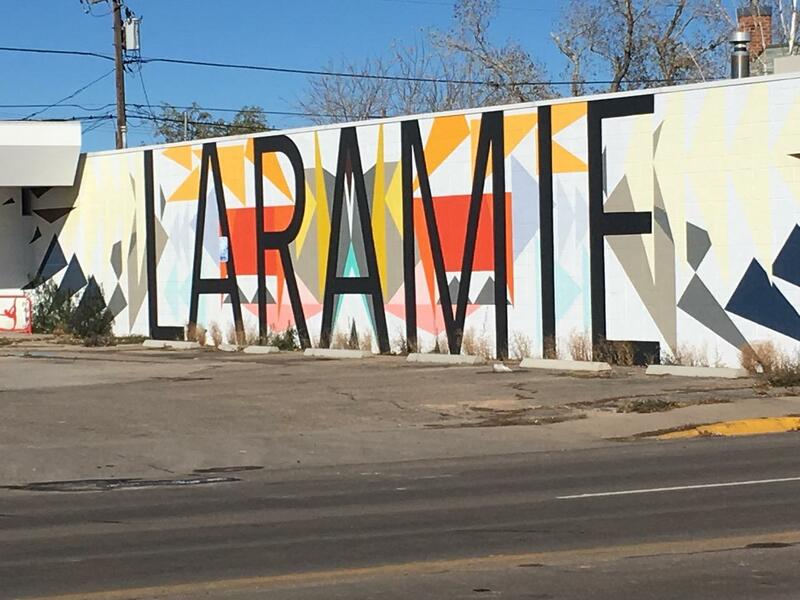 . .
Brenda found another interesting sign on a Denver-area street. 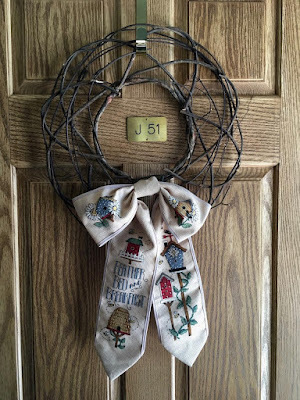 Brenda has a sharp eye and snaps photos of the unusual things she sees and shares them for "Blog Fodder." Other photos Brenda has shared can be found here. corner of East Grand Ave. and 22nd St.
“The silhouette of a cowboy riding a bucking horse has long been the symbol of the State of Wyoming. The cowboy astride a bucking horse represents the toughness, pride, spirit, and independence of Wyoming. 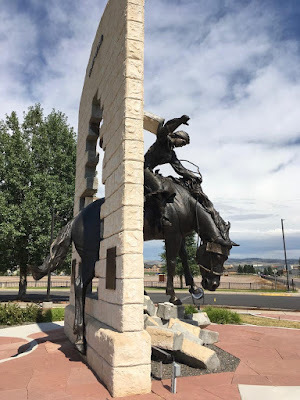 The scupture has been modeled on the great bucking horse Steamboat. 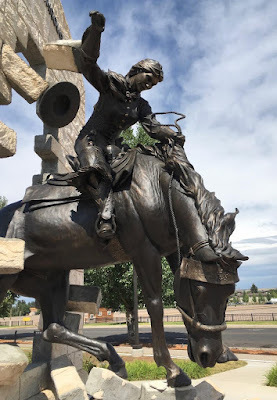 This famous bucker bred in Wyoming was voted “worst” bucking horse of the year at the Cheyenne Frontier Days Celebration in 1906 and 1907. Steamboat was jet black with three white socks and had a powerful build. 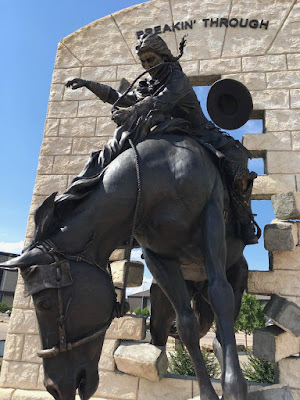 When he was a colt, he sustained a broken bone in his nose that caused him to make a whistling sound when he buck, and that is why the cowboys gave him the name Steamboat. The old-time cowboys said Steamboat would buck his heart out and wouldn’t quit. Chris Navarro's work can be seen in many locations in the United States. Photos of his sculptures can be seen here. 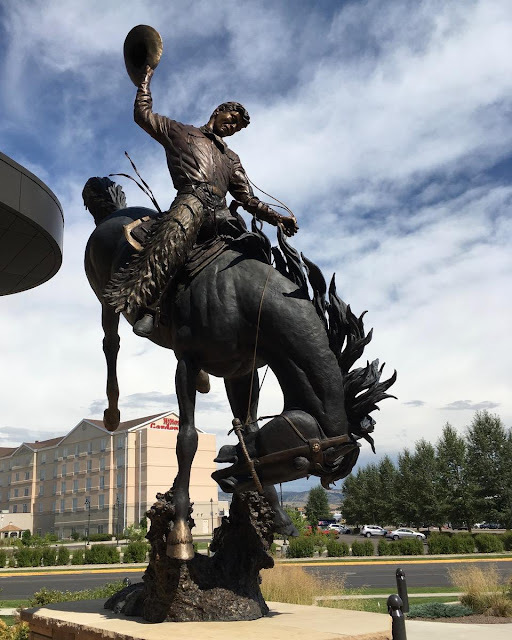 A distinctive silhouette of Steamboat and a cowboy is featured on Wyoming license plates and is copyrighted by the State of Wyoming. 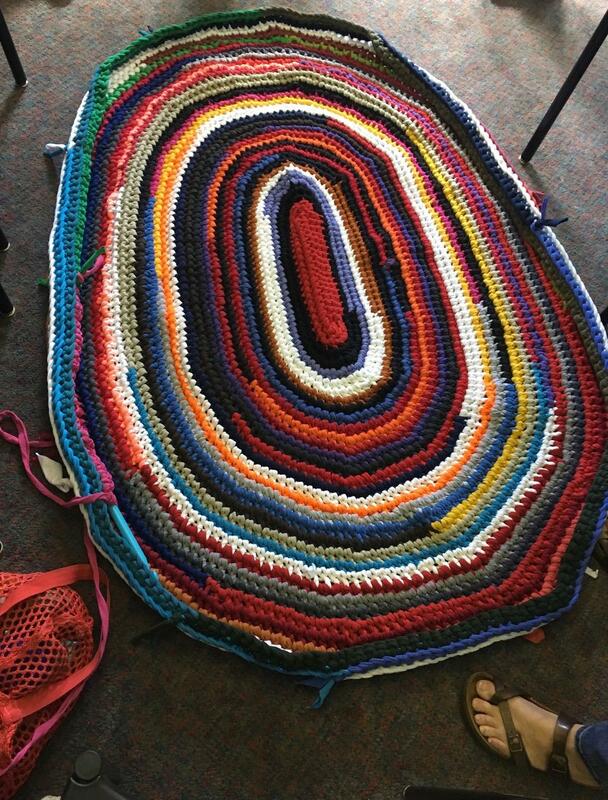 LeAnn has been crocheting on this T-shirt rug for several weeks at the Crochet/Knit group. She is keeping all the knots on the backside of the rug. I love all the colors. LeAnn said she would continue until the red bag shown bottom left is empty. Several years ago, I knit a small rug with T-shirt "yarn" and huge needles. I used the rug at the door to collect damp shoes. I haven't seen it, so I wonder if it survived the move. 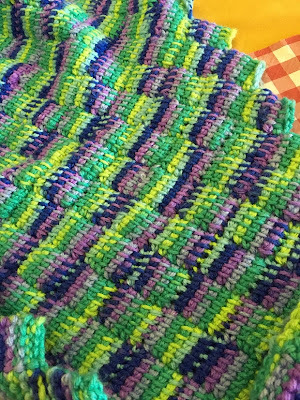 Julie's entrelac blanket was the hit of the day. Everyone gathered around to see the process. 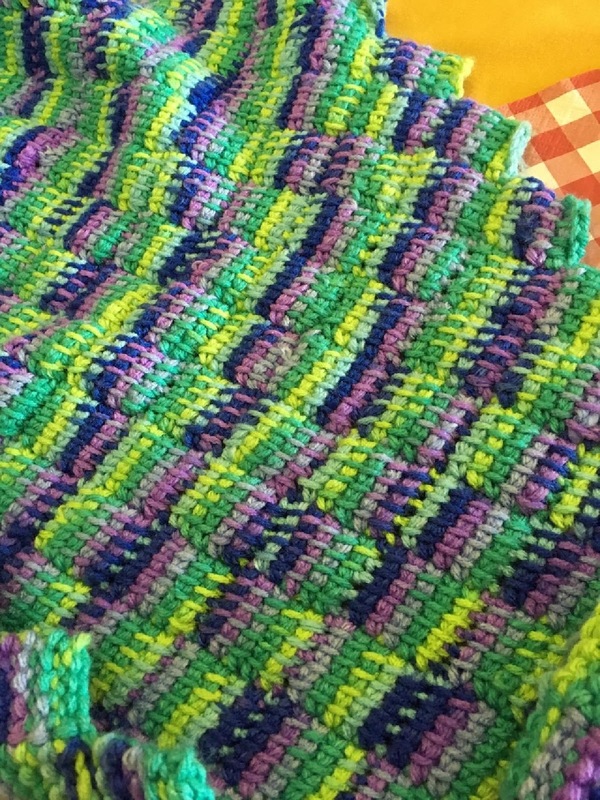 I've seen entrelac that was knit, but this was the first time I'd seen crocheted entrelac. Have you knit or crochet with T-shirt yarn or knit or crochet entrelac? I took my car to have the windshield wiper blades replaced with winter blades and to have the windshield washer sprayer fixed. Even with an appointment, the wait time was longer than I expected (nearly three hours), so I was glad to have my knitting bag and some dishcloth cotton with me. Knitting the simple dishcloths is my go-to project for mindless knitting. Often the magazines in the waiting areas are geared to men (hunting, fishing, cars, etc. ), but this waiting room did have some food and wine magazines in addition to the usual mix. In addition to the Taiko performance, the Japanese Festival included a few traditional Japanese songs played on the Koto. I actually remembered the songs, and they triggered some wonderful memories. 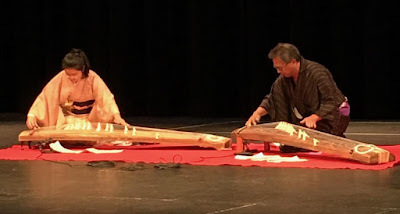 The instrument, similar to a harp, has a distinctive sound. 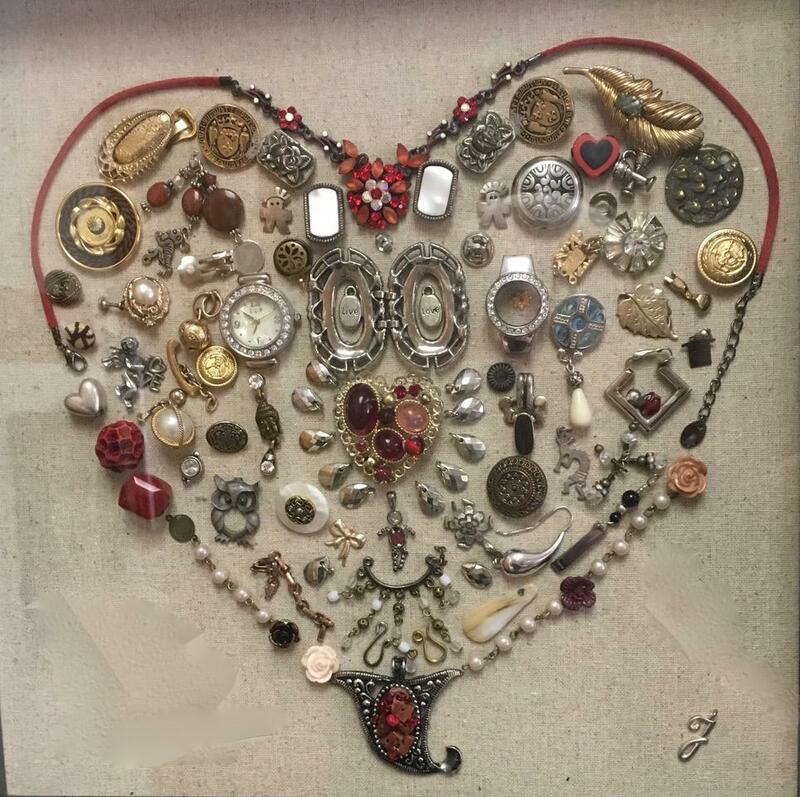 I started on this project for Marilyn in June or July when one of the ladies (Val) in the Needlers group wanted to try the pattern. Even though it was a knit along, I got distracted with packing and moving, so Val finished her shawl weeks ago. Somewhere along the line, I unintentionally "altered" the pattern, and the back increases are off (thankfully, I was consistent in the alteration). 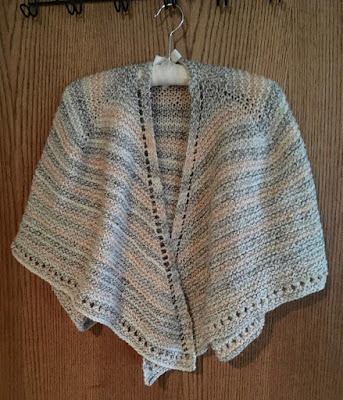 Even though the pattern calls for the shawl to be knit to fall at the wrist, I knit it to fall just in the crook of the elbow. That shorter length makes it more comfortable to wear around the house or to cover shoulders while sitting in a chair. Slowly, ever so slowly, the project on my needles is growing - stitch by stitch. 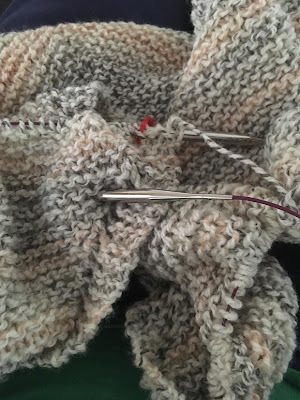 Currently, there are more than 300 stitches on the needles, and every other round, I add six stitches. I'm knitting the Utilitarian Faroese Shawl (Ravelry link), and hopefully, I'll finish it this weekend. 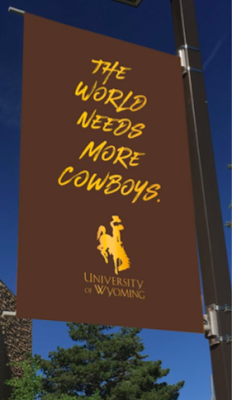 The University of Wyoming is the home of the Cowboys, and sculptures of cowboys are placed liberally around campus. Breaking Through was dedicated in 2015, yet in 2018, its female rider unwittingly represented the university's new marketing slogan: "The World Needs More Cowboys." The slogan created quite a ruckus this summer on social media, as one professor thought it was too sexist. I'm sure the professor understood the purpose of the marketing campaign but chose to turn it into a springboard for her own agenda. As an alum of UW, I consider myself a Cowboy, and throughout my life I've also been a Panther, a Shaman, a Bulldog, an Eagle, and a Cougar. What were the mascots of the schools you attended? 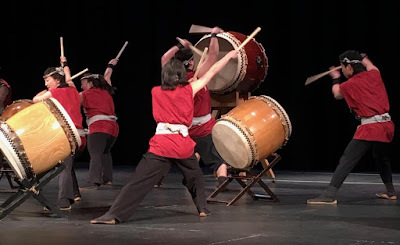 Saturday, I attended a small festival at Laramie High School that featured Denver Taiko. 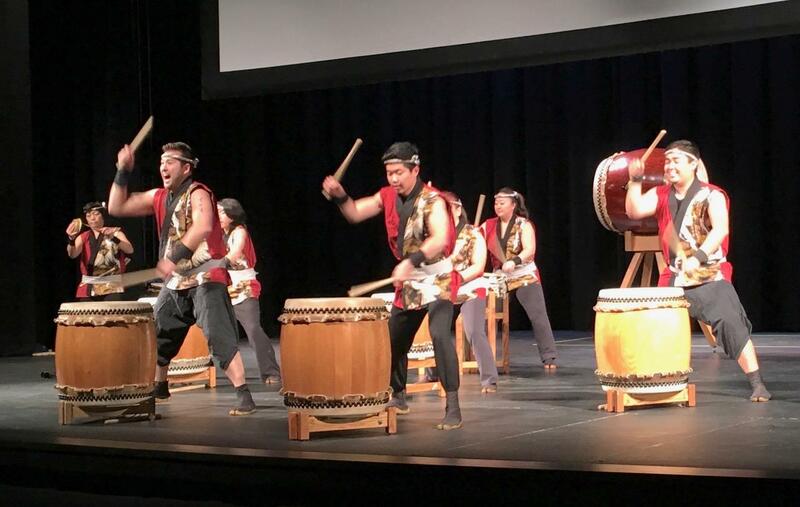 I loved the energy and joy of the drummers, and I enjoyed their hour-long performance. 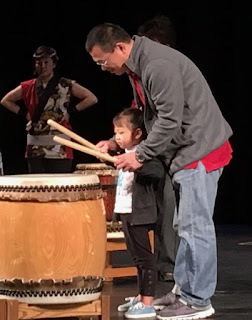 The group invited audience members on the stage to learn the drumming techniques. They also involved audience members who chose to stay in their seats. This adorable little girl and her father did very well with the drumming technique.